In the wake of climate-fueled disasters and several alarming reports on climate change, a gap is evident — a gap between how the world is responding to the climate crisis and how it should. A new study appearing in Nature Climate Change (Feb. 25, 2019) examined three sets of satellite data using three teams of scientists. The scientists’ findings now have a five-sigma level of confidence that climate change has anthropogenic cause; labeled a statistical “gold standard” it means a one-in-a-million chance of error. Having proved conclusively that human activities are responsible, they hope their work will spur change. There is now plenty of new and accumulated evidence of global warming, and of human involvement. Heat trapping gases concentrating in the atmosphere cause an energy imbalance manipulated in a warming earth. About 93% of this heat is accumulated in the oceans. The rising ocean heat content (OHC) becomes a record of global warming. New research based on OHC observations over time shows a disturbing acceleration in ocean warming. Without proactive measures to reduce global warming, the report demonstrates an increasing rate at which oceans warm for each scenario it simulated. It warns of major global impacts such as a sea level rise of 30cm by 2100, unprecedented severe weather events, and coastal flooding. Overall temperature in the oceans is now the highest since record-keeping began. Moreover, ocean levels are already 7cms (about 3 inches) higher than in the 1990s (keyfinding 1), human-caused climate change being a major culprit. The rise appears to be accelerating, now at the rate of 3.9 millimeters a year or about an inch in 6 years. Coastal land loss from flooding is no longer just a problem faced by The Maldives in the Indian Ocean, or Pacific Islands like Kiribati. 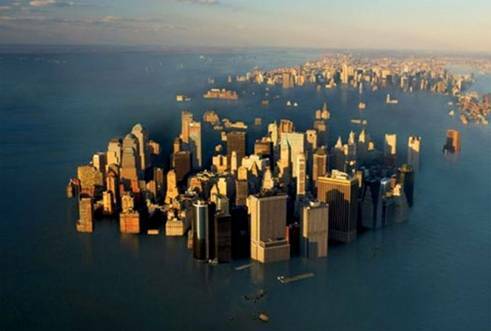 Low-lying coastal cities in the US have begun to flood at high-tide. This nuisance tidal flooding is expected to increase 5 to 10 fold (keyfinding 4). Tell-tale signs of the exacerbation of weather events are already here: Hurricanes intensify quickly and then move slowly shedding unprecedented amounts of rain. It happened with Harvey over Houston in 2017, and with Florence over North Carolina in 2018. What might come as a surprise is the fact that half of the world’s annual rainfall and snow pelts us on the 12 wettest days of the year and by century’s end the same amount of precipitation will occur in 11 days. So reported scientists last November. A warming atmosphere means it can hold more moisture; thus more intense deluges will further test the ability of the soil to absorb the water leading to an increased likelihood of worse flooding. Changing weather patterns also have other consequences. In California, large fires now burn twice the area they did 50 years ago, and are expected to triple that by 2050. Future projections point to both bigger fires and a longer fire season. And then who would have expected a heat wave in Canada to kill more than 90 people in 2018? It is not alone. The UK suffered debilitating summer heat in 2018 and 2017, and a heat wave hit southern Europe in 2018 where Portugal and Greece were also hit by wildfires. The same is true in the Southern Hemisphere, where Australia suffered an intense heat wave in January, while its wildfire season now starts earlier, is longer, and is more devastating. Experts confirm these effects to be long term in a new joint report: The climate has warmed 1C since 1910; the sea levels around the country are rising; stream flow patterns in the country are changing; and rainfall has decreased except in Northern Australia. “Australia is experiencing climate change now …” is the blunt appraisal from the director of the climate science center at the Commonwealth Scientific and Industrial Research Organization (CSIRO) which issued the report jointly with the Bureau of Meteorology. The U.S. ‘National Climate Assessment’ last November did not mince words when it reported, “The evidence of human-caused climate change is overwhelming … the impacts of climate change are intensifying across the country.” The report is mandated by Congress and affirmed by science agencies of the government. President Trump, who religiously opposes climate change believing it to be a natural phenomenon that will reverse itself also naturally, had a brief response: “I do not believe it.” About the report’s estimated economic impacts, Sarah Sanders, his press secretary, claimed the report was “not based on facts.” The “facts” on which the Trump administration reached its conclusions have not been released. Sadly their indifference is not harmless because when the US changes tack on climate action, it gives other countries leeway to do the same. China has slackened and Brazil’s newly elected president, Jair Bolsonaro has promised to open more of the Amazon rain forest for development reversing its CO2 capture into more CO2 emission. CO2 happens to be the most sensitive gas to the heat radiation wavelengths reflected back from earth, sending more back to earth. All this at a time when the UN sponsored Intergovernmental Panel on Climate Change released its latest report last October setting off alarms. Comprising the work of hundreds of the world’s leading climate scientists, it predicts a grim future and a narrowing window of action. Labeled the 1.5C report, it looks at a 1.5 degree Celsius rise in mean global temperature from preindustrial levels. We are already experiencing the effects of being 1 degree above, and according to the report should reach the 1.5C level by 2030 to 2052. It leaves a 12-year window to act before the process becomes self-sustaining and uncontrollable. Even at 1.5C above, 70-90 percent of the world’s sea corals would be lost; the Arctic sea ice in fast retreat threatening polar bears and raising sea levels; and with higher ocean temperatures worse severe storms, rain and flooding. A safer move would be to start removing CO2 from the atmosphere, perhaps even now. Certainly the Paris agreement, holding temperature increase to 2C, is no longer a viable alternative if we do not wish to leave behind a raging planet to our children and grandchildren. Carbon capture from the atmosphere is difficult and expensive. Climeworks, a Swiss startup has a pilot project outside Reykjavik, Iceland, removing 50 tons of CO2 a year. For perspective, about a trillion tons are expected to be emitted by 2100, while researchers limit the potential for direct air capture (DACCS) at the most to 5 billion tons per year or about a quarter of the emissions. The cost also is high at $100 to $300 per ton, and it requires considerable energy usage — a 300 to 500 Megawatt power plant to remove a million tons annually reports Scientific American (January 2019). Another alternative might be to remove it at the source. That means at power stations and factories, and there are claims of new and more affordable processes offering hope. However, most carbon emission comes from transportation, and it points to a future of electric cars using electricity from CO2 scrubbed power stations. That is also the thesis of Greg Ballard’s newly released book, “Less Oil or More Caskets.” The book’s title refers to the human and military cost of protecting the free flow of oil. A former Marine Lt. Colonel and two-term Republican mayor of Indianapolis, he is a long-term advocate of electric cars and rapid-transit electric buses, the latter underway in Indianapolis. He even managed to secure federal grants despite Trump’s opposition, proving both that Trump is not unassailable and some Republicans are seeing the light. It only goes to prove, Trump is not unassailable. Neither is climate change although the window to act narrows by the day … provided there is the wherewithal to shape the necessary and urgent changes in public policy, and the public pressure to force Trump’s hand. That he eventually caved on the shutdown shows it’s possible. Greta Thunberg a 16-year old Swedish schoolgirl’s decided to stop attending school on Fridays and picket her parliament to draw attention to climate change. She followed up with an address to COP24 in 2018 and the World Economic Forum in Davos this year galvanizing a student protest movement in Europe demanding action on climate change. Led mostly by girls, it has led to school strikes by tens of thousands of young students across Europe, and now they have called for a day of unified global action on March 15. In addition to a March 15 strike in the US, continuing protests as in Europe are urgently needed to support the girls.